The second Thai Festival in the Russian capital was held on September 12-13. Thai cuisine, dance performances and Muay Thai lessons greeted visitors at the second Thai Festival in Moscow. 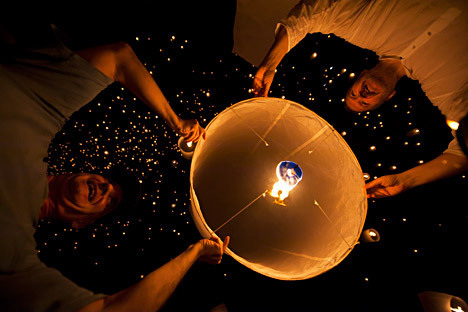 The festival was held on September 12-13 in Kuznetsky Most, where Loi Krathong decorations were set up. Visitors to the festival could sample Thai food, as well as buy food products made in the kingdom. Muscovites were also treated to Thai foot massage sessions. Thai massage systems are becoming increasingly popular in Russia. Around 15,000 people are believed to have visited the two-day festival, which was organized by the Thai Embassy and the Moscow City Administration. The Tourism Authority of Thailand also set up a special booth with the latest information about tourist destinations in the kingdom. The tourist season in Thailand commences in October. Thailand remains one of the most popular destinations for Russian tourists, although the ruble’s fall over the last year has led to a drop in visitors to the kingdom. Thai Airways officials said the airline’s Bangkok-Moscow service would be restarted when tourist traffic picks up between the cities. The service was suspended in February 2015. Thailand and Russia have a visa-waiver program for short-term visitors.